California based Christyl O'Flaherty, self taught and following the footsteps of her photographer grandfather, inspires us in many ways. Her passion to create magical, enchanting moments and her incredible eye for the beauty in others and her surroundings shines through her mesmerising, fairytale like work. Christyl's latest work tells a story of a carefree, fun loving dame on her throne enjoying the luxuries she's surrounded with... meet "Lady Binx"! The idea started with a beautiful wedding gown Christyl found on a social site that belonged to one Margaret Howe McCaffery. Margaret wore her dress while strutting down the aisle in 1942 Beverly Hills, California. Margaret Howe McCaffery's wedding in 1942, Beverly Hills, California. Once purchased at J. Williams, a department store no longer in existence, the wedding gown had served its purpose and got handed down years later from one generation to another. By the time Christyl had laid her eyes on it online, it belonged to Margaret's grand daughter Cathy, now 82 years of age who kept the treasure hidden in her closet. Knowing that it would bring much more joy to Christyl, her team and countless viewers in the future, Cathy kindly donated the dress. "I have to admit, my heart pretty much ached after I left that dress with you. But then, I thought about how it would only sit in my closet, deteriorating, when it could be bringing joy through your wonderful inspirations! I sooo look forward to seeing your creations! Don't forget me. Love to you, my new friend!! Cathy." The photoshoot was put together rather quick and soon after. 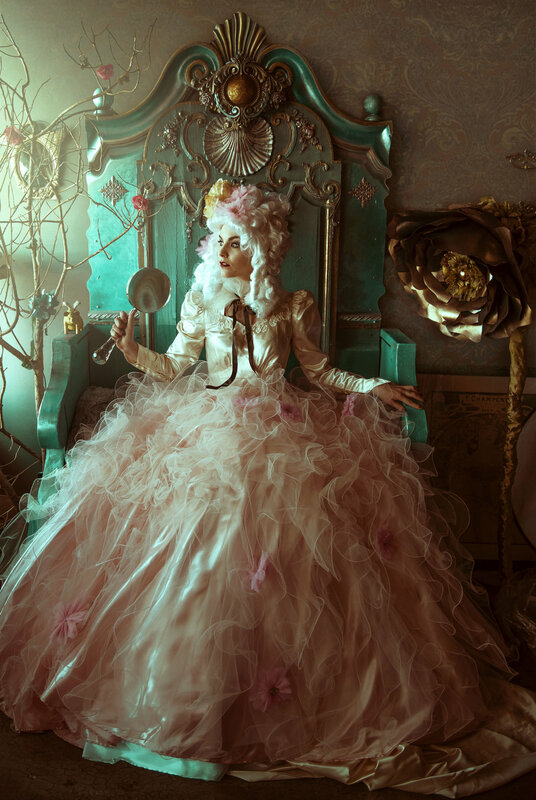 Shot in Christyl's studio Muse Factory, a throne (painted by Chelsea Starling) was erected in the lobby near a window, with by-passers stepping over the scene. 1942 Wedding Gown & Quinceanera Dress ready for the shoot. Christyl and her model Jessica Pierce had a fun, spontaneous shoot playing with different garments and props, such as a flying pig statue, a stone rabbit, an old quinceanera dress, a giant magnifying glass and some wonderful costume jewellery. Pretending to be wine-drunk ladies at an old French chateaux, the pair captured scenes of lavish medieval nobility and carefree abundance. The images were lit by daylight coming through a nearby window and one single speed light for fill. After the shoot Christyl decided that the colour grading of her images should portray a certain degree of comfortable warmth, while still preserving the fun of the day. She wanted her viewers to be able the "feel" the scene, to smell the lavender and caramel and become part of the story. Unedited, out of camera images. Playing with the Infinite Color Panel Christyl found a pleasing combination of colours within moments. She ran the panel in "Light" mode and masked out a few areas until the desired end result was achieved. Christyl tells us proudly how the colours applied to her final work brought this story to life and tied together a fairytale that started one magical wedding day in 1942. We're in love with the results! Older PostInfinite Color War: Our First Color Grading Contest!